What were you doing at 23-years-old? For Cellina Santos and Jan Wesley Samson, they clean the dishes, they man the counter, they serve the meals—while all these sound tedious work, these tasks are what make them successful in the role they play now: restaurateurs. After almost a year of working behind desks, the young professionals dared to ask that which most will brush off as rhetorical: what if? 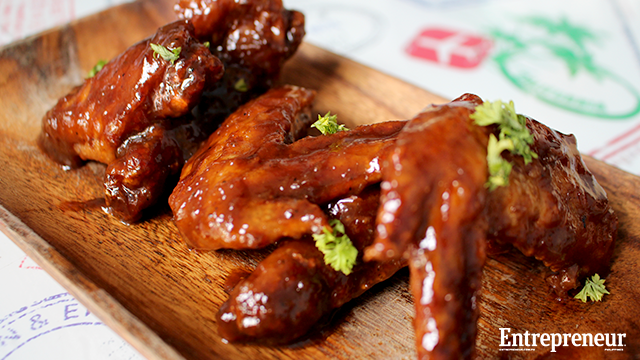 As Maginhawa Street is booming as a dining destination in the metro, Santos and Samson found the perfect location within the vicinity for what will soon become the center of their lives: Griddle: Steaks X Wings. But the decision was far from easy. The partners shelled out a total of Php 700,000 as capital pooled from their savings and some loans. Gambling with such risk and without any business background, the first few months proved to be both exhausting and fulfilling for the first-time entrepreneurs. After signing the contract in May, the partners had to finish the construction of their place in three weeks or pay for rent without starting operations. This meant sleepless nights for the two, from brainstorming their menu, planning the interior design and seeking suppliers. Samson overlooked operations while Santos handled all the executive and marketing work. After a month of construction, Griddle was born. 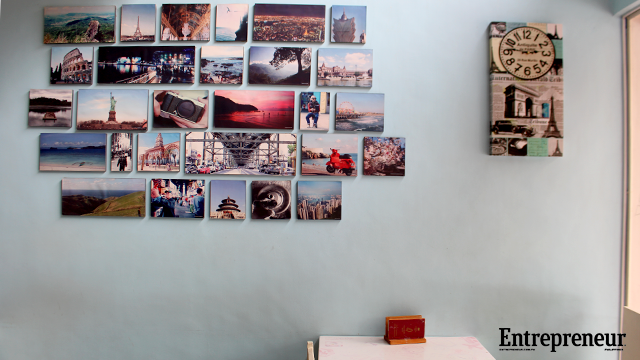 The travel-themed restaurant serves comfort food on a budget, specifically below Php 200. 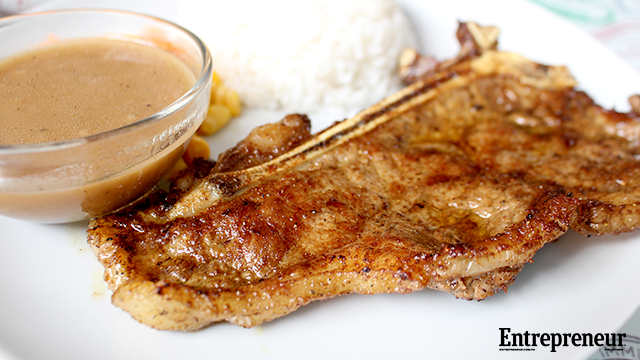 The most expensive steak meal, the Griddle steak, is only Php 180, while most varieties of chicken wings are only at Php 140. Most dishes are cooked on a griddle, hence, the name. “We wanted to keep everything on a budget, thinking mostly of students. When we opened, there was only one steak place in the area and it was quite pricey,” Santos said. While the restaurant can only occupy 30 people at the most, its eye-catching interior makes up for the space it lacks. 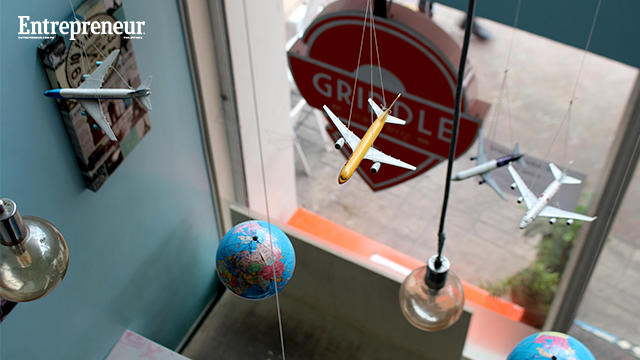 The team’s love for travel is apparent in every glance, with one wall occupied with snaps of some of the best sights in the world while miniature planes hang from the ceiling. Their attention to detail and value-for-money offerings have already earned them fans with a 4.7 star rating on Facebook and 4-star rating on Zomato. A quick geo-search of their place on Instagram will showcase hundreds of photos taken at the restaurant. This continuous pursuit for improvement push both partners to be at their best. While some comments from customers sting, these all the more empower them to get better at what they do. These days, negative comments are at minimum. The menu has also expanded to more offerings at 16, doubling the dishes they had when they first opened. It is no surprise then that these young restaurateurs have already managed to recoup their investments only after a year and a month in operations. More than a year since embracing the entrepreneurial life, all the more Samson and Santos realize that their job today is still oddly normal, and this time, they’re more than ready to take in more challenges. “Will you give up over that small challenge and let everything you worked hard for go into waste? Of course not. You can always resolve any challenges or at least that’s what we believe in,” Santos said. Aside from their fearlessness, another secret ingredient to Griddle’s success is the working relationship between the two. While some go against working with close friends, the partners’ friendship proved to be the pillar of the business’ success. “I think you should be opposites [for the business relationship] to work. It works on everything, we always meet halfway. I’m more understanding to customers, while she’s more palaban [to suppliers],” Samson said. “You should also have the same values and passion. You might have problems along the way if you partner with someone who isn’t as committed to the business as you are,” Santos added. They are now setting their sights to further expanding their menu, developing a loyalty program and hopefully, in two to three years’ time— develop a new concept under Griddle’s name. True, not all young guns have the same stubbornness the two possess. Venturing into a business takes a certain kind of crazy, especially with all the uncertainty that comes to play. Santos and Samson insist they were both hesitant at first too, but like every dream, it will never be accomplished without taking the first step.